The innovative blockchain solution for collateral swaps in the securities lending market is expected in the first half of 2019. With our clients, we have a created a real alternative for clearing interest rate swaps within the EU. Equity derivatives: Introduction of Single Stock Futures and equity options on Alcon Inc. 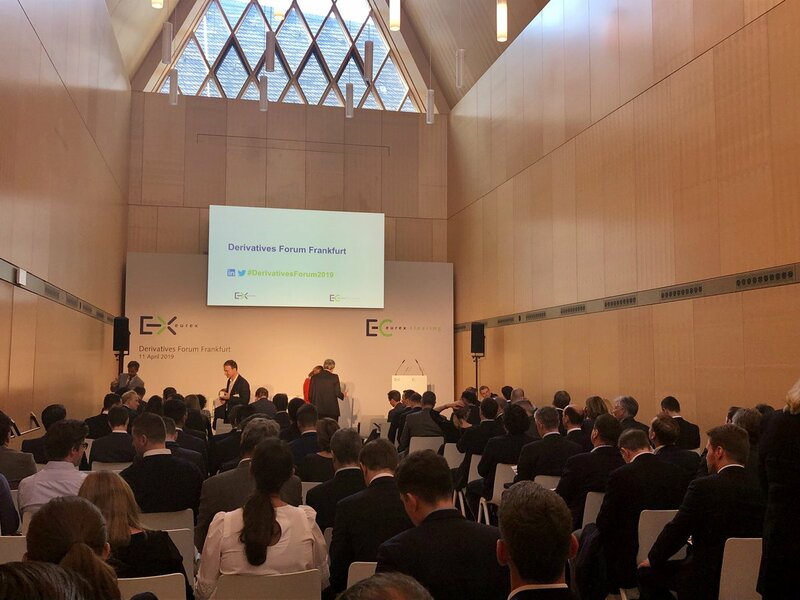 The house is packed, and we’re ready for the #DerivativesForum2019 in #Frankfurt to start! The number of traded contracts at Eurex Exchange grew by 5 percent, helped by a 24 percent increase in European equity derivatives and a monthly record in Euro-OAT contracts. Eurex Repo saw an increase of 23 percent in average monthly volume in the Repo market. EEX also saw increases of 42 and 19 percent in the trading volumes of power and gas respectively. Your one-stop shop for information on the availability of our trading and clearing services and of selected reports. As a new feature, an RSS reader allows you to automatically get updates on delays of selected reports. Folgen Sie uns auf Twitter und unseren LinkedIn Kanälen Eurex und Eurex Clearing. Es ist lebhaft, schnell und immer auf dem neuesten Stand. Wir sehen uns dort. MiFID II will start the probably largest structural change that Europe's derivatives markets have ever experienced. In an article published in the Börsen-Zeitung, Eurex CEO Thomas Book talks about the implications for Eurex. Eurex has taken MiFID II as an opportunity that goes far beyond solving regulatory issues. Find out more in The TRADE’s interview with Randolf Roth.